Starting public school can be intimidating for both parents and children alike. There seem to be so many moving pieces and so many things to get done. Not to mention the emotional roller coaster that many of us find ourselves on as we realize that our babies just aren’t babies anymore. I, like so many mothers, found the whole damn thing daunting. So in an effort to allay the fears of any coming behind me in this process I have developed this simple step by step guide. Stop by the school and get the required forms. Cry when the registrar hands you the “Bus Service Request” form at the thought of your tiny little baby riding the big scary school bus. Realize this woman is not the sentimental type and quickly wipe away the tears. Schedule a tour with the guidance counselor. Take the tour with your child in tow. Ask the guidance counselor about 150 questions regarding curriculum that are clearly above her pay grade. Receive an email from the Assistant Principal requesting a meeting to address your questions. Set it up for the next day. Laugh politely when she dismisses your crazy talk. Realize you have lost the required forms. Request new forms from the registrar. Make an inappropriate joke about how your taxes should cover that. Fill out the forms right there so as not to lose them again. Attempt to turn in forms only to be handed a list of “additional paperwork” that must accompany the forms. Realize you have none of the additional paperwork with you. Call the pediatrician’s office to get immunization records. Get lost in the phone tree and get mistakenly rerouted to the voicemail for the office manager who quit 3 years ago. Take a deep breath and decide to just drive up to the doctor’s office. It’s going to be a 20-30 minute wait. Decided to run home to get the rest of the paperwork together. Go through every last piece of paper in the safe, your file cabinet, your kitchen counter, your “to be filed” pile. Realize that you do not have a copy of your child’s birth certificate. Google “How to get a copy of a birth certificate”. Realize that you will now be driving downtown to the Department of Health to obtain a copy. Also take note that you have expertly managed to make sure that you will now be arriving right during their “peak times” as listed on the website. Now print out a copy of your most recent utility bill. Curse your printer as it displays an error message. Realize this is a losing battle and pack up your things to go to your husband’s work to use his printer. Before you leave try to find your property tax bill. Realize you don’t have a copy of this either. Fight back the tears of frustration when she tells you she put it in the file she gave you. Realize that it is not there. By some miracle the registrar doesn’t remember you and can hear the desperation in your voice. She offers to print out the tax bill for you. Grovel at her feet in thanksgiving. Get in the car to go to hubby’s work. Drive right past the pediatrician’s office. Pick up the immunization records. Realize you haven’t eaten all day and drive through McDonald’s as you don’t have time to do anything else for lunch. Show up at your hubby’s work with a sackful of cheeseburgers and fries and proceed to stuff your face as you feverishly print out your AT&T bill and vital records applications. Pack all of your things back in your car and begin the 30 minute drive into downtown during lunch hour. Turn into the Department of Mental Health by mistake. Wonder if you should just stay here. Finally make it to the right parking lot and into the Vital Records office. Step over 4 people sitting on the floor practically blocking the doorway to get to the receptionist. Take the number she hands you “B98”. Look at the TV screen above her head and realize there are 19 people ahead of you. Ask her how long it might be. Make your way into the waiting area and notice there are no empty chairs. Decide to run to the restroom. Consider getting a tetanus shot while you wait to protect you from what was living in that restroom. Return to the waiting area to wait with the finest sampling of human beings you could ever imagine. Pull out the laptop and write a blog post. Now there’s only 12 people ahead of you. Ignore the puddle of unknown substance that you just stepped in that soaked into the hem of your jeans. Make a note to burn your jeans tonight. Take deep breaths when the mom next to you hands her 2 YO an iPad equipped with a drum set app to play with. Vow that your children will NEVER play the drums. Ever. Finally get your child’s birth certificate and RUN out of there vowing never to return. Pull up to the school with ALL of your documentation and realize that it’s dismissal time and there is literally no way to pull into the campus because of the 10 mile long car pick up line. Drive back and forth in front of the school several times trying to find a way in. Ignore the crossing guard’s concerned stare. Pull into the bus parking lot (going the wrong way) and ignore the angry looks and gestures from the other parents, teachers, and bus drivers. Park your car illegally because there are no parking places. Hike the 200 yards to the front office- aren’t you glad you wore heels today? Proudly hand over all your documentation to the registrar and sigh with relief. 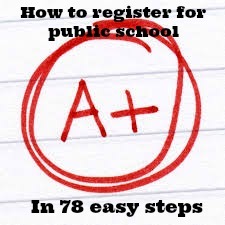 I hope this easy to follow step-by-step list can help all you mommas navigate the overwhelming trappings of public school and maybe even help you skip a step or 73! Good luck! !